There's no shortage of articles available detailing the KPIs SaaS startups should track. But, the term "SaaS startup" casts a wide net - you could be anything from a B2C startup with a freemium model to an enterprise-focused B2B startup operating exclusively on yearly contracts. Depending on where you fit in that spectrum, some KPIs are relevant to your growth, and some are not. So, for our inaugural article, we wanted to focus on (often) overlooked KPIs for a specific set of SaaS startups - subscription KPIs most relevant to the growth of B2B SaaS startups on a self-service model (i.e. anyone can start a free trial with your product without interacting with your team). Why? Because if I can basically guide myself through your entire funnel, then there are very specific parts of that funnel that need to be measured and optimized along the way. So, let's dive into these overlooked KPIs that can help measure the success of this (somewhat) self-guided journey! Your trial qualification rate measures the effectiveness of your marketing efforts to reach and appeal to your target market. Since anyone can start using your product, it's essential to not only measure the number of new trials over time, but also the percentage of those trials that are actually qualified opportunities. Why? Because you want to ensure that 1) your marketing is accurately communicating your solution to the right people with the right problems and 2) that your target market is not only ok with getting things setup themselves, but that they prefer it. What do high & low values mean? High: Your marketing is accurately reaching your target market, and your target market is driven enough to get things started with little to no help from your team. Low: Usually, this means that your marketing efforts cast too wide a net - copy & problems presented are overly generic, appealing to people that have little chance to actually purchase your product. It could also mean that your target market doesn't actually prefer self-registration - they'd rather have some help. In any case, if this remains low for an extended period, it means you could be burning a lot of cash on the wrong efforts. Naturally, you'll want to start with identifying your target market (e.g. our target market is B2B SaaS companies with at least $5K in MRR - extra points if they use a tool like Segment or Mixpanel). Self-service trial programs can also result in high volumes of new trials, so you'll likely want to automate the process of identifying ones in your target market with a data enrichment tool like Clearbit. Beyond our own product (🚨 plug alert), we aren't aware of other tools that support tracking this KPI automatically, but give us a shout on Twitter if you know of any and we'll list them here! While your trial qualification rate measures the effectiveness of your marketing to draw in potential customers, your trial conversion rate measures the success with which you convert qualified trials into paying customers. If the majority of your new business comes from converted trials, tracking this KPI is a must. Otherwise, it will be quite difficult to ensure month-over-month growth. Including trials outside your target market in your KPIs: Self-service trial programs can result in a good bit of noise (and sometimes spam). If you aren't filtering that noise out when measuring the success of your trials, then how can you accurately determine if your trial program actually resonates with your target market? Simply tracking the number of converted trials each month: While better than nothing, you'll still want to track your trial conversion rate to ensure that a healthy proportion of trials continue to convert over time (especially as the number of total trials increases). High: Your target market is motivated to use your product - they have a problem and realize you may be the solution. Additionally, your onboarding & help materials are adequate and accessible enough for your customers to experience success with little guidance from your team. Low: One of the more common issues here is usually related to your product's onboarding - it doesn't adequately guide the user to your magic moment. Getting this right is especially important for your free trials - since they haven't committed any hard dollars to your business, they don't have a ton of patience or motivation to sit through a difficult onboarding process. First, follow the steps for measuring trial qualification rate above. You'll want to find some way to tag new trials in your target market, and then another way to track when those trials either 1) convert to a paid subscription or 2) let their trial expire. Setup a Zap that runs when trials convert to paid subscriptions. If you use something like Stripe to track trials, this should be doable. Again, using Zapier, then enrich the converted account with Clearbit to determine if they are in your target market. If the account is in your target market, setup another step in your Zap to update a number that tracks converted trials in your target market in something like Geckoboard or Airtable. Naturally, you could also update a different number that updates regardless of whether you deem the account to be in your target market. Repeat that process for trials that expire without converting, updating a different number in Geckoboard/Airtable. Setup a custom formula in Geckoboard/Airtable to divide those that convert by the total of converted + unconverted. Track monthly to ensure continued, proportional trial success! You are probably already tracking your current MRR, number of paying customers, and churn (if not, best get on that). But, do you know how much MRR you lose or gain from your existing customers each month? Do you know if that scales linearly as your MRR increases? 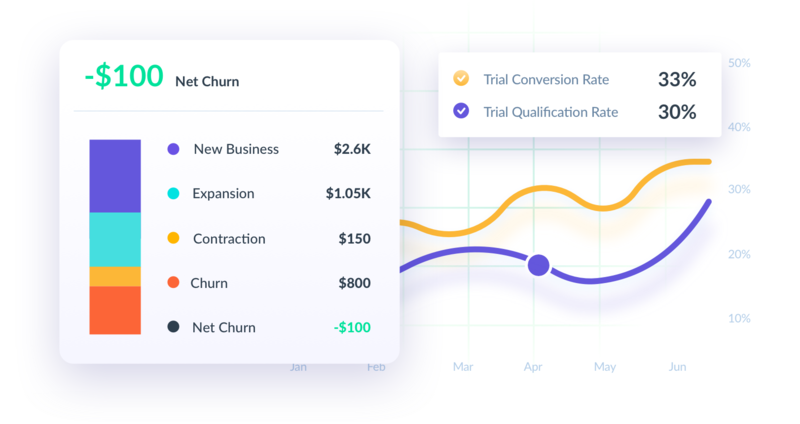 Net churn (sometimes called 'negative churn') measures your ability to offset lost MRR (from contraction or churn) with expansions and upsells from existing customers. Perhaps above all KPIs, this one is the most telling of future growth. Why? Because if you can increase MRR without gaining customers, then you've proven you can provide continuous value to your customers (that they are willing to pay more and more for). You are also better protected to withstand 'dry spells' in acquiring new customers. Net churn is the rare KPI where negative values are good - you want negative net churn. Finally, it's ideal to track this as a percentage compared to the revenue you had at the beginning of the period being measured. This way, you can easily ensure your net churn scales linearly with your MRR. High: Again, high values are bad for net churn. A positive value for net churn means that you lost money during the time period from your existing customers, which puts pressure on sales/marketing to offset that loss with new customers. Essentially, you've got a leaky bucket - question is, can you pour more into the top to offset what's lost at the bottom (and do so continuously)? You'll probably want to use a tool with subscription analytics capabilities to track your net churn rate over time. It's not the easiest KPI to calculate otherwise, as it requires knowledge of every customers' historical MRR paired with the ability to detect upgrades, downgrades, and cancellation of subscriptions. This Quora post provides a nice rundown of common subscription analytics tools that should be able to help here. Of course, you should be tracking way more than just these 3 KPIs. David Skok of Matrix Partners put together a pretty exhaustive list that you should definitely check out. However, if you've already covered the basics and are looking to fill in some gaps in your KPI tracking, then hopefully these 3 KPIs provide a helpful starting point!